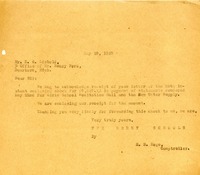 Mr. Hoge writes to Mr. Liebold to acknowledge the receipt of letter and check in payment for the Girls School Recitation Hall and New Water Supply. 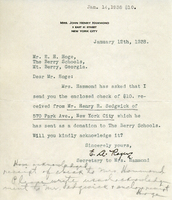 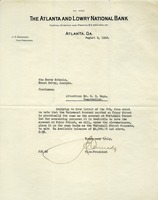 A letter from the secretary of Henry Ford about a big donation to go towards the new recitation hall. 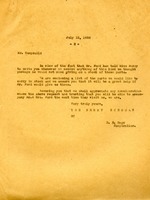 E. H. Hoge writes to Mr. Campsall, a representative of Mr. Ford, to request a stock of parts. 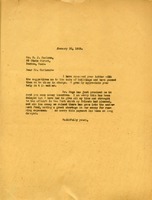 He encloses a list of parts needed. 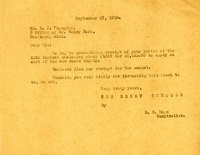 The Merriam Coal Company writes to the Berry Schools, in particular Mr. E. H. Hoge, to send their last subscription payment, wishing that their contribution to the schools could be greater. 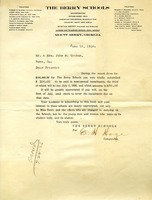 Martha Berry writes to E. H. Hoge telling him that she authorizes him to pay for property around Hammond's Hill that may be purchased for the need of water power development according to Mr. Keown's judgement. 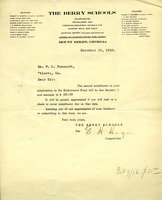 E. H. Hoge writes to Mr. Prescott, reminding him that the second installment of his subscription to the Endowment Fund will be due on January 1st. 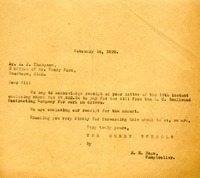 Mr. Hoge writes to the Grahams to remind them of their pledge to the Berry Schools, the first installment of which is due in July. 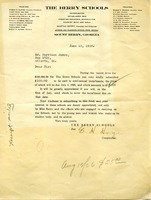 He thanks them again in helping with the great mission of the Berry Schools. 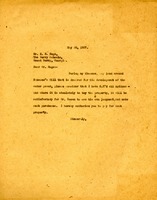 Hoge reminds Jones of his commitment to semi-annual installments on a $100 subscription.